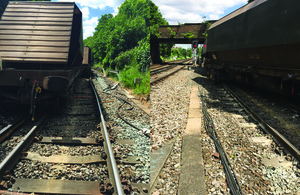 RAIB has today released its report into a freight train derailment at Angerstein Junction, south east London, 3 June 2015. At about 12:10 hrs on 3 June 2015, one wagon of an empty freight train derailed on the approach to Angerstein Junction, near Charlton in south east London. The train continued over the junction, derailing two further wagons, before it stopped on the Blackheath to Charlton line. The three derailed wagons were partly obstructing the line used by trains travelling in the opposite direction. No other trains were involved in the accident and no-one was injured, but there was significant damage to the railway infrastructure. The wagons derailed because the leading right-hand wheel on one of them was carrying insufficient load to prevent the wheel climbing up the outer rail on a curved section of track. The insufficient load was due to a combination of the suspension on that wheel being locked in one position, a twisted bogie frame and an intended twist in the track. As a consequence of this investigation, RAIB has made three recommendations. The first, addressed to VTG (the wagon owner), seeks improvements to its wagon maintenance processes. The second, also addressed to VTG, seeks liaison with industry to improve understanding of how wagon suspension wear characteristics relate to maintenance processes. The third, addressed to Network Rail, seeks a review of infrastructure arrangements at the accident location. The report also includes a learning point reinforcing a previous recommendation intended to encourage use of currently available wheel load data to enable identification of wagons with defects or uneven loads that are running on Network Rail’s infrastructure. The sole purpose of RAIB investigations is to prevent future accidents and incidents and improve railway safety. RAIB does not establish blame, liability or carry out prosecutions. RAIB operates, as far as possible, in an open and transparent manner. While our investigations are completely independent of the railway industry, we do maintain close liaison with railway companies and if we discover matters that may affect the safety of the railway, we make sure that information about them is circulated to the right people as soon as possible, and certainly long before publication of our final report. For media enquiries, please call 01932 440015.